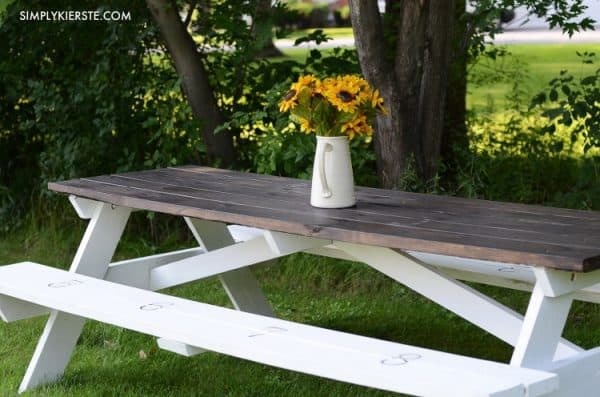 Create your own outdoor living space with one of these DIY picnic table ideas! 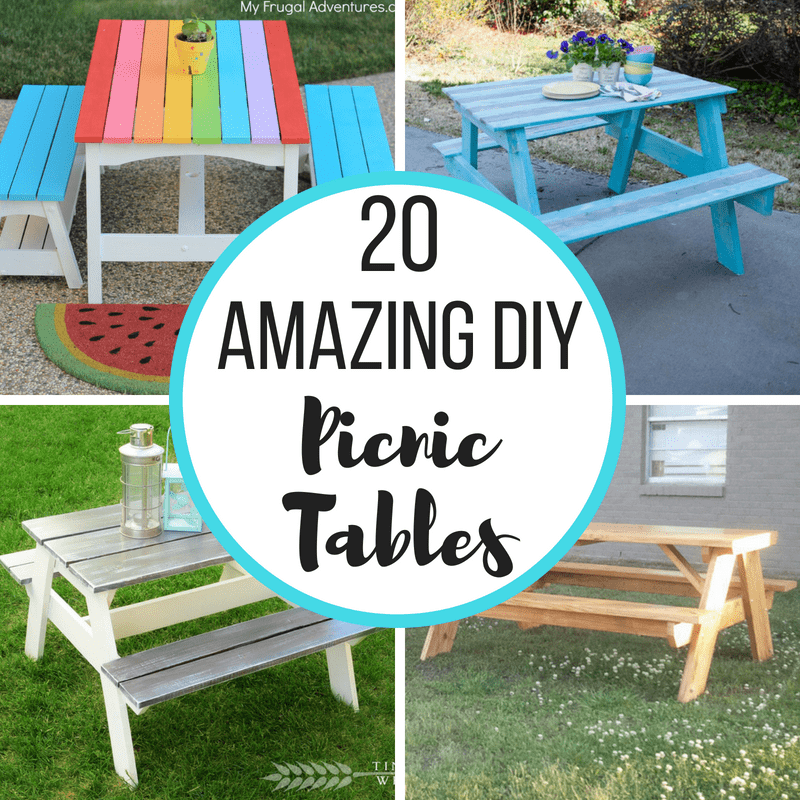 Whether you want to update a pre-made one or build your own picnic table, there’s sure to be the perfect outdoor table and benches for you in this list. 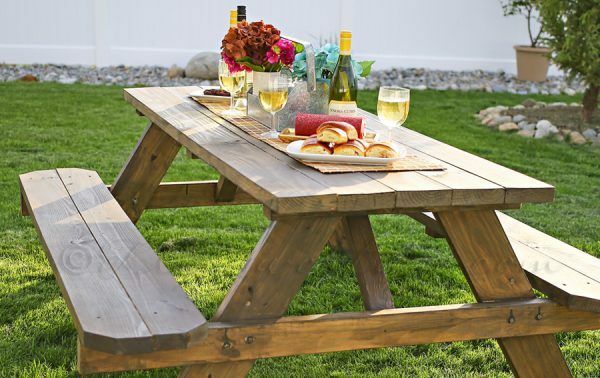 Nothing says summer quite like a picnic in the backyard! 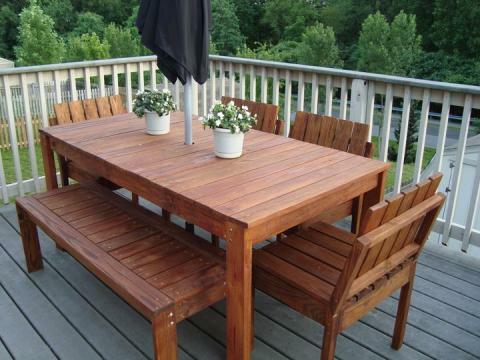 We’ve been using a cheap IKEA dining table and chairs on our deck for years, but it might not survive the whole season. 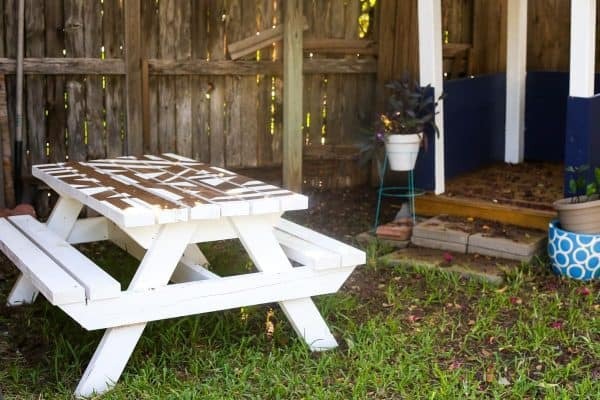 I’ve been researching DIY picnic table ideas, so I’ll be ready to build when our current table bites the dust! 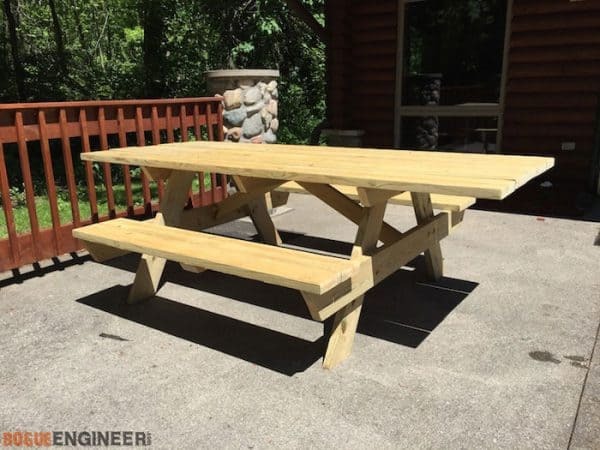 Not everyone wants to build their own picnic table from scratch. Whether you buy a kit or score a used one on Craigslist, you might want to infuse it with a bit of your own personality. 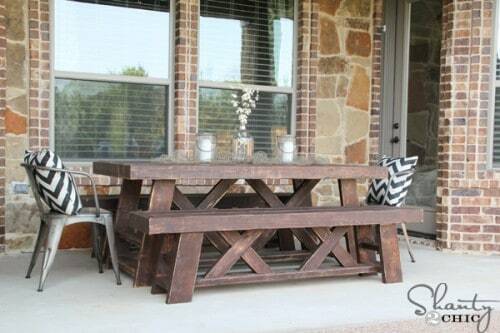 Here are some great ideas for taking your outdoor dining area from basic to beautiful! 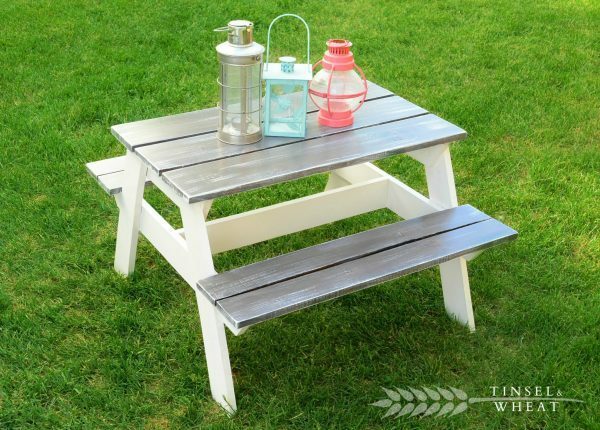 Easy DIY Picnic Table Kit – Kleinworth & Co.
Ready to tackle building your own picnic table? 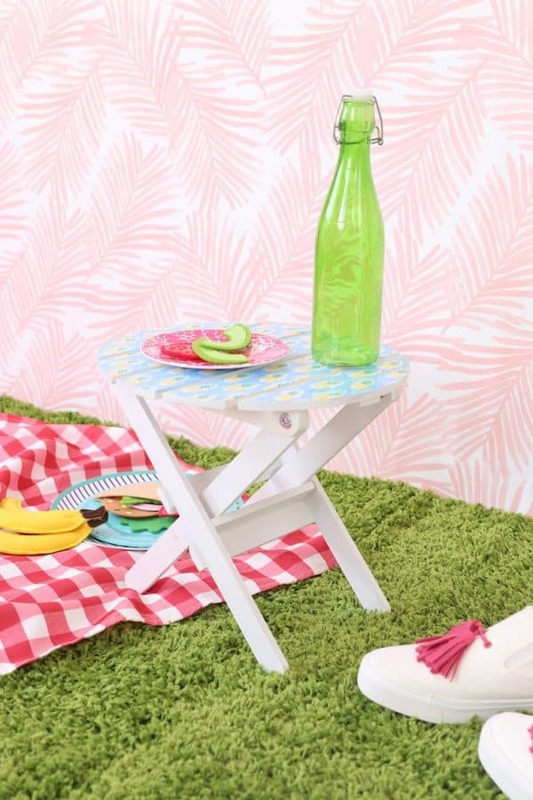 These simple designs will have you eating al fresco in no time! Don’t forget about the kids! 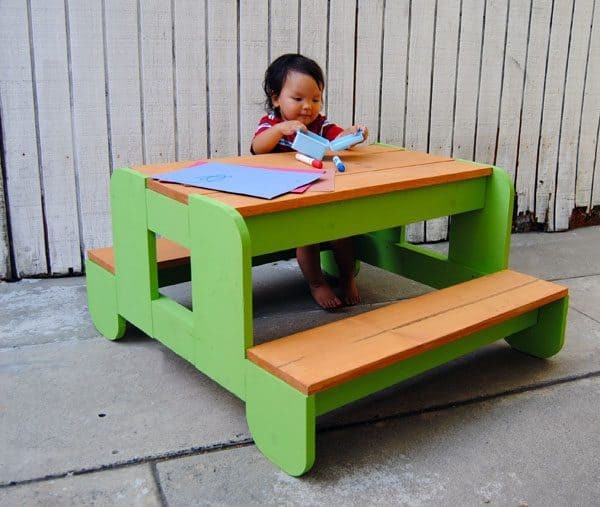 Make them a pint size picnic table for eating, drawing and playing outdoors. 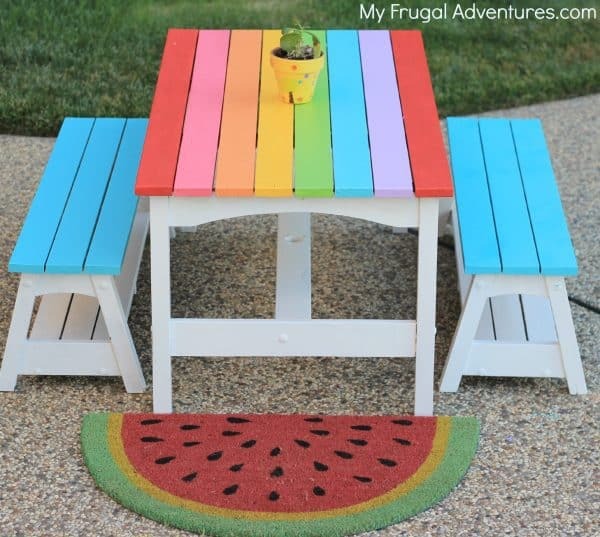 Add a fun pop of color to the backyard with bright colors that you normally wouldn’t see in a larger set! 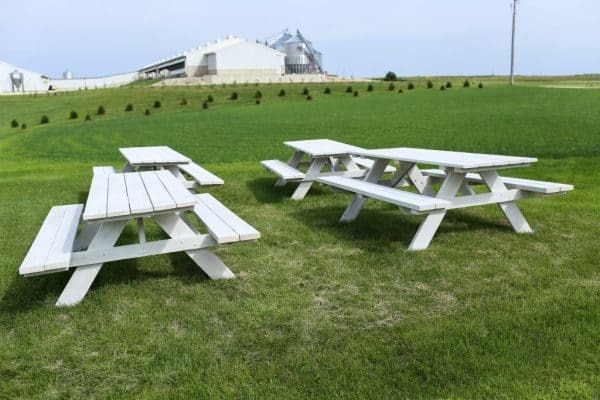 These tiny picnic tables are perfect for dining in the grass! No more spilled wine glasses or balancing a plate in your lap! Just pop one of these on top of your picnic blanket for a sturdy snacking surface. 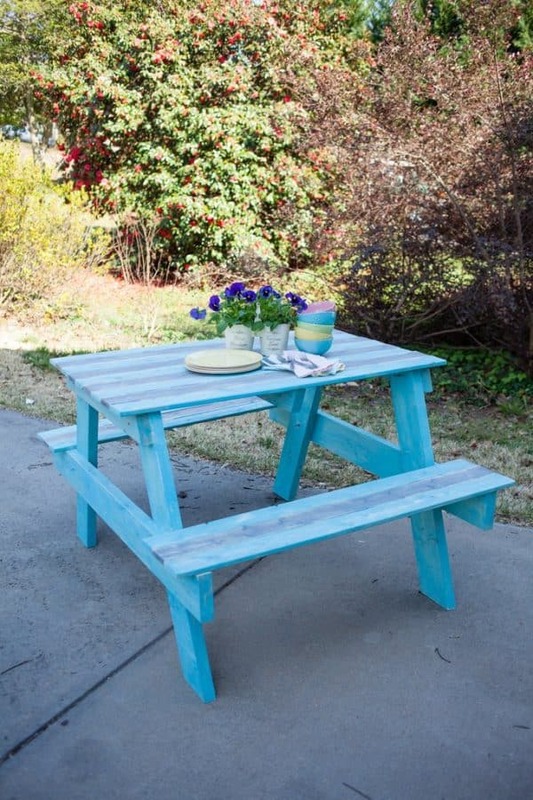 These DIY picnic tables go the extra mile! 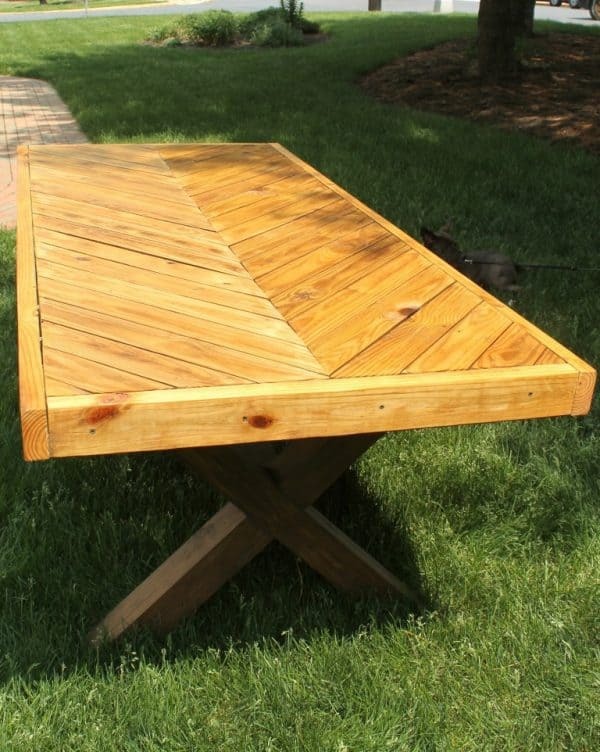 If you want to build something unique for your backyard, look no further! 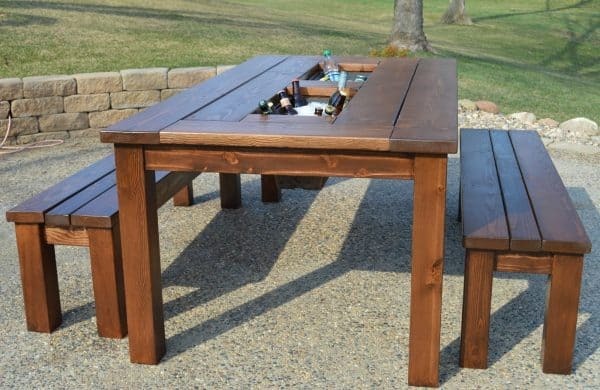 Keep drinks cool while you hang out at this clever picnic table! 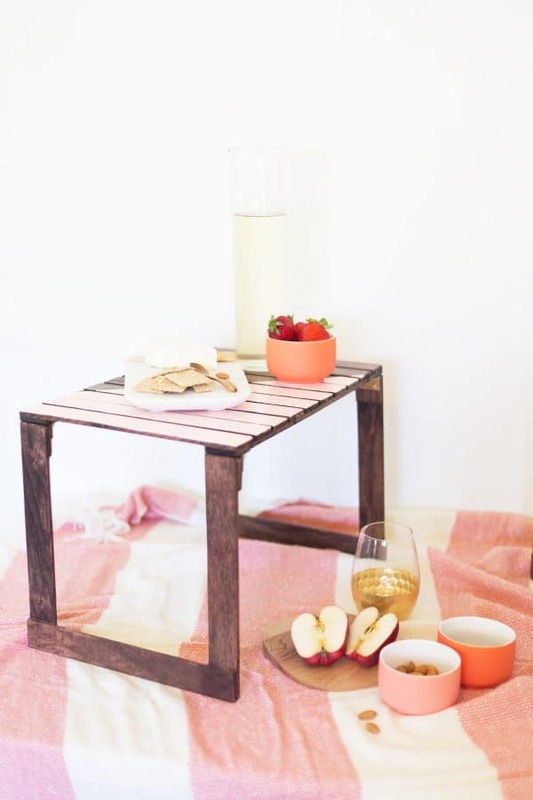 If you want a smaller version, try my DIY end table with built-in cooler instead! Wheel right up to this wheelchair accessible picnic table! I’ve seen versions of this at parks all over our city. How amazing is this! 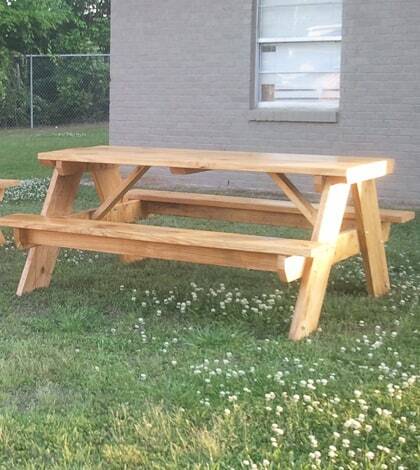 Go from picnic table to benches and back again in seconds! 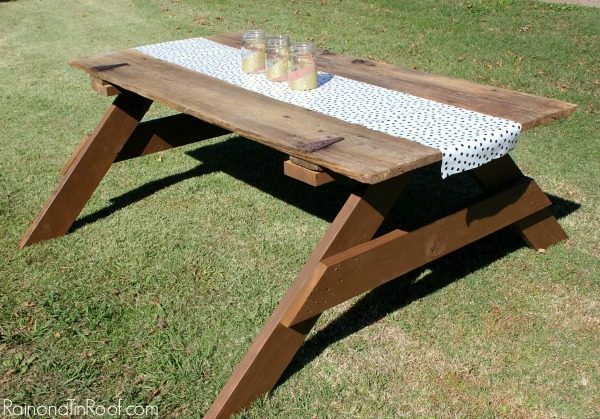 If you have an old door that you just can’t bear to part with, try turning it into a picnic table! I love how the hinges are still attached to this one. 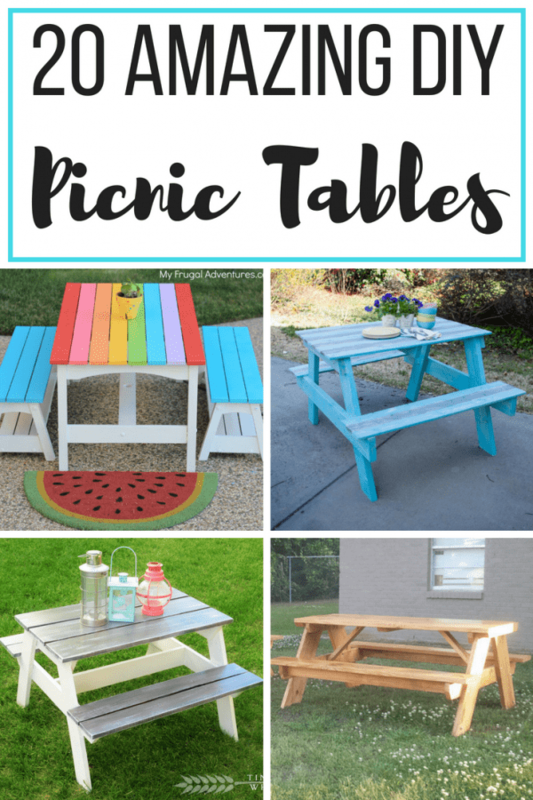 Which one of these DIY picnic tables is your favorite? I can’t decide which one will go on my build list! I love all of these. I don’t know how I’ll pick which one to make. Each one is awesome in its own way. I can totally get away with making 2 if one is for the kiddos, right? Lol! Thanks for sharing your round up with us at Merry Monday this week! So glad I saw this post on the Dream Create Inspire Link up this week. 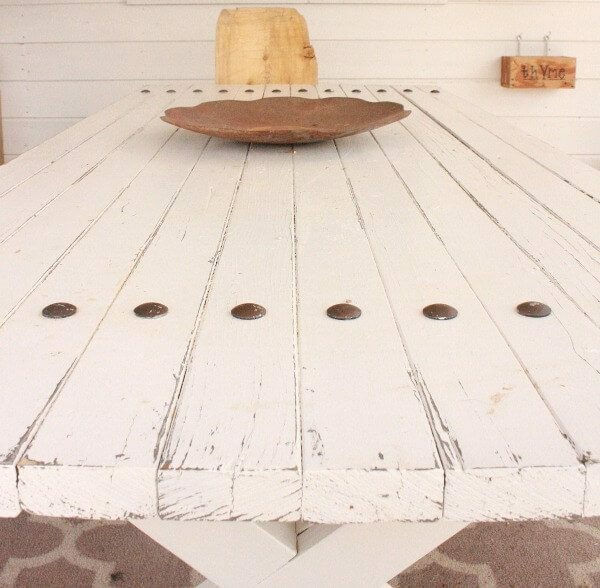 We are looking for a new table for our screen porch and you included some great finds. So many fun picnic tables! My favorite is the white washed farmhouse one. Thanks for sharing with SYC. 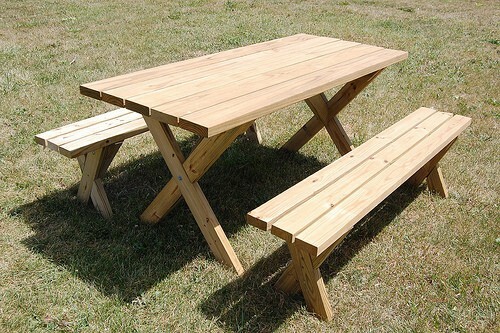 OMG, I love these picnic tables, they are fabulous. Hard to say which I love best.